Steiff Trampili Elephant Comforter is hand made in the finest grey and pink cuddly soft plush. 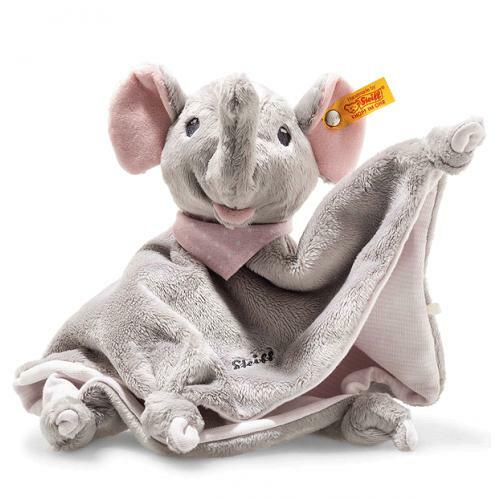 Trampili elephant comforter is 28 cm in size and is made of soft and cuddly plush fabric for your baby's soft skin in pink and grey. The inner ears and mouth are pink. The non-removable pink scarf with white spots is a real eye-catcher. In the centre of the comforter, the "Steiff" logotype has been embroidered in dark grey. This incredibly soft blanket has knots in all four corners that will encourage your baby to grab and feel them.